I reviewing the database, itemset meeting with idset that do not correspond to items (DBC), this causes the add command additemset correct and incorrect items. The content of the linked issue was "not able to use additemset, it can't find the set in dbcs". That problem is fixed, and that was the reason why it is already closed. You describe a different problem, sure it is related to the closed one but the content is different. We can't expand an single issue to another, that would be bad practise and we are not able to "track it easy" in the future. So please if there is an issue with the data in the database, create a new issue. It looks like there are some duplicated data, so someone should check it out and create an sql world update for this. It is true what you say, but there are flaws that are linked effect if. You fixed part of the fault, now we must correct the database. I expose here if you see something extra, before updating the field and leave the correct itemset. I'm working on database events (call to arms), and I've gotten a lot of mistakes. The post was edited 1 time, last by armm77 ( Dec 13th 2015, 5:14pm ). If someone would take care for this, give me a sign. Yeahr, unfortunately if have to compare all setids to the new handler.... so this will take some time. Correct, although it is a command that is not used often and just administrative. Blizzard sometimes gives the same Set ID to other items, Its mostly been done with there Cata PVP items. While working on this I found some interesting facts maybe someone can check that too. We have several itemsets in ItemSet.dbc but most itemsets are missing. While checking wowhead and some old sniffs I saw that most arena and tier sets have a negative setid (especially these sets are linked to the highes itemsetid in their group. I will give you later an update. Finally I have finished my work on this problem. I don't know who submitted the changes for the itemsets a funny fact is, that tc has the same wrong setids in their database (and someone said arc is hacky... -.-). The last 3 days I have done a lot of research for this. 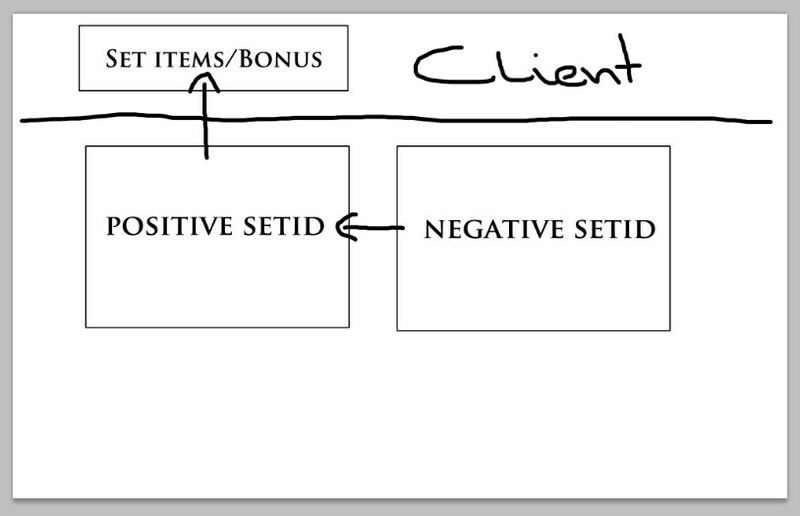 At the beginning I thought some sets are grouped (negative and positive setids) and at the end I'm quiet sure only negative setids are grouped to another setid. To keep that in mind, the setids in items table are now correct (develop branch) If there is missing the itembonus for a set link it in the items_linked_itemset table.